Chris Milk’s “The Wilderness Downtown” is an interactive play where your home and past are offered and yet remain out of reach. The film requires a few more steps before your viewing pleasure: if you don’t have Google Chrome or Safari as a browser, please download one of them to view this experimental and interactive film. And I would suggest, for this week, reading this commentary as an afterword. Let your experience of the interactive film come before mine. Two weeks ago Numero Cinq Magazine‘s “At the Movies” presented Milk’s music video for the Gnarls Barkley song “Who’s Gonna Save My Soul.” But Milk also does experimental work. “The Wilderness Downtown” is an interactive music video Milk made with the band Arcade Fire for their song “We Used to Wait.” To begin you have to enter the address of your childhood home. 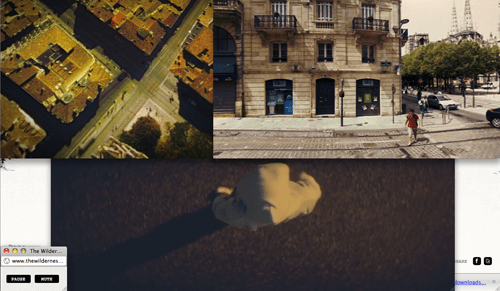 The video then develops a montage using images of a hooded, faceless man running, a flock of birds, and images it pulls from Google Earth of your childhood home. The resulting film hangs in multiple windows, creating a hybrid montage / collage. Montage usually relies on one image following another and collage implies something static; here we have the collisions of montage happening side by side and the effect, I’d argue, shares the randomness of dream logic, a narrative choice that encourages us to be more associative than strictly interpretive, calling up our own memories rather than seeking to understand the artist’s intention. The film’s “protagonist,” is a faceless, hoodied figure running full out and urgently. The Google footage starts at a bird’s eye view, then carries down to street level as you approach your home. This is not purely nostalgic. Certainly the images of home are not real time, are past tense, but they probably don’t resemble your memory of your childhood home. So the montage is nostalgic and yet memory is probably challenged, troubled by how time has changed those places we once knew. Memory and distance. 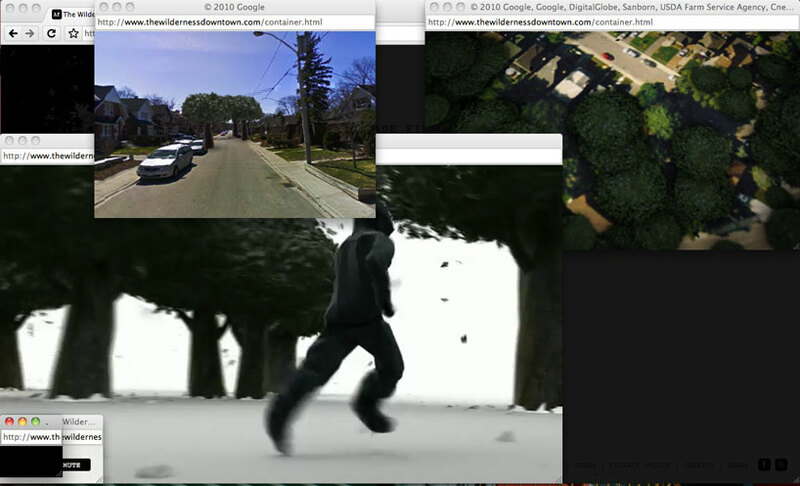 As home is reached in the Google images, the runner stops in the middle of the street. Neither he, nor we, get home, though we get to stand on the street outside looking in. At the end of the film, a window pops up that invites you to “Write a postcard of advice to the younger you that lived there then.” You are offered the opportunity to write past / through that troubled nostalgia, towards that unreachable childhood. In this way, “Wilderness” promises a return that it instead withholds, and, perhaps, offers in its place an experience of the impossibility of return. You can’t go home, goes the old saying. “The Wilderness Downtown” meditates on this. 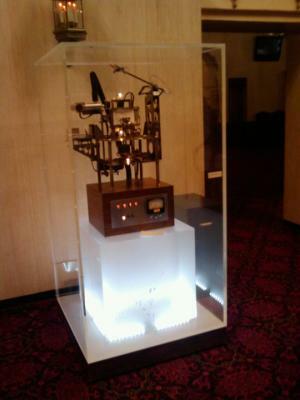 The Wilderness Machine generates actual postcards from the handwritten notes submitted at the end of the interactive film. The machine has a special arm that recreates the handwriting on compostable seeded paper which when planted will grow into birch trees, emulating the images from the end of the video. Life will imitate art. Each postcard is printed with a unique code so that people who visit the machine and receive a postcard can use it on the website to write back to the sender. So the machine in essence delivers your postcard, but it also withholds your mail, refuses to send it to its impossible destination (you as a child). Your postcard will always arrive at the wrong destination. But still it arrives and it connects to random strangers who might just write you back. It’s these people I like to think about: addressed as though children; addressed from the future present; these readers who are both imposters and mistaken identities. What words might make them write back? And will you? So excited to see “The Wilderness Downtown” as this Thursday night’s movie choice, RW! It works very well with my “Childhood” meditation this week. I’ve interacted with the video several times, but I’ve never received a postcard from the wilderness machine. Perhaps this is best: like the speaker in Arcade Fire’s song, I’m held in the liminal space of waiting, reminded of how “something so small can keep you alive.” Thanks for this! Rob, This is very cool. I drew a postcard thingy, quite stunning. I lived in many different places as a child; as a result I kept playing the film, kept sending postcards, kept sending words back which, unfortunately will never be delivered to the different me(s) I once was. Wow, this is amazing!! It couldn’t find my childhood home, but I’m going to try some other addresses. Yeah, I grew up in a trailer park in a fishing village up near Alaska so I think the Google Earth truck decided to go drinking instead of getting coverage of the slums. For some of us, home is even more elusive.